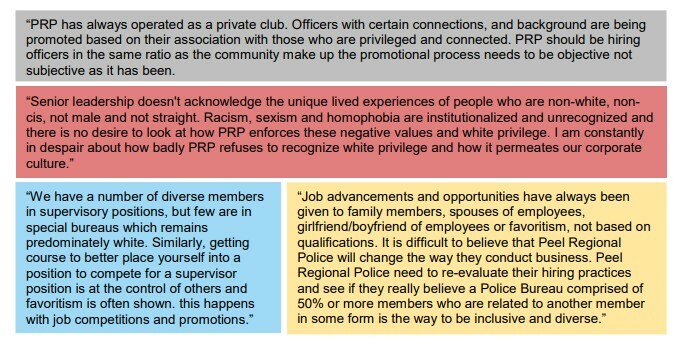 A diversity audit of the Peel Regional Police has dismantled any doubt about the service’s failure to live up to its own statements about diversity and inclusion, painting a picture of a police organization that systemically discriminates, harasses and punishes those who come forward with serious concerns. 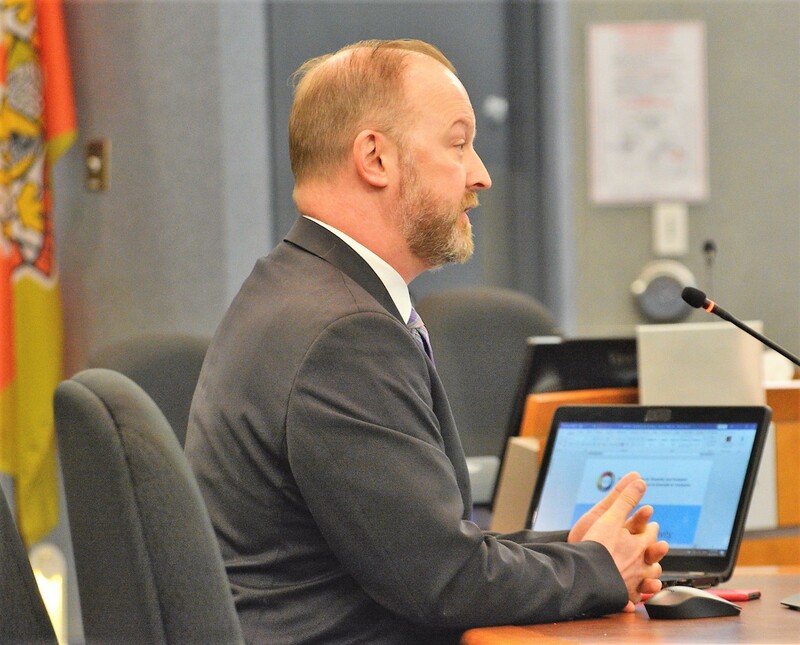 After months of delays, a diversity audit completed by the Canadian Centre for Diversity and Inclusion was presented to the Peel Regional Police Services Board earlier today. It reinforced many of the complaints and concerns that have been raised by community advocates for years. Brampton Mayor Patrick Brown told the board he was “grateful” to see signs that action is being taken to address the issues. 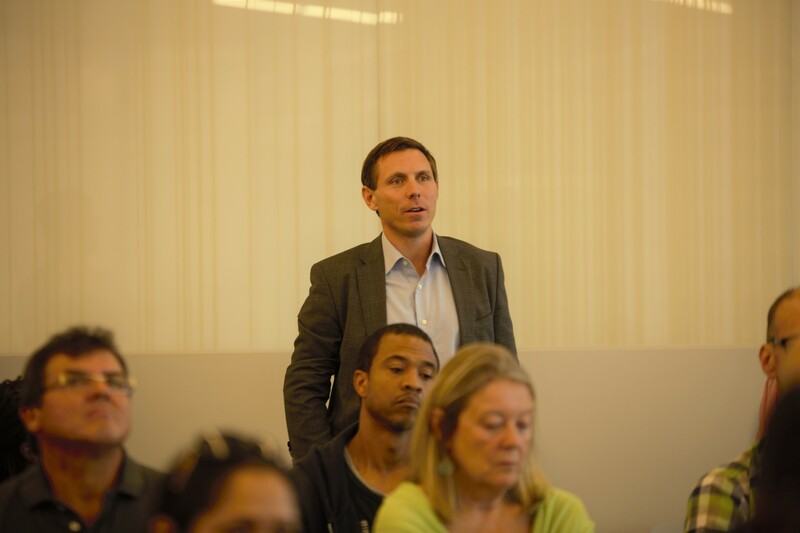 Mayor Patrick Brown, at a community meeting on crime in the summer, says the audit report is long overdue. 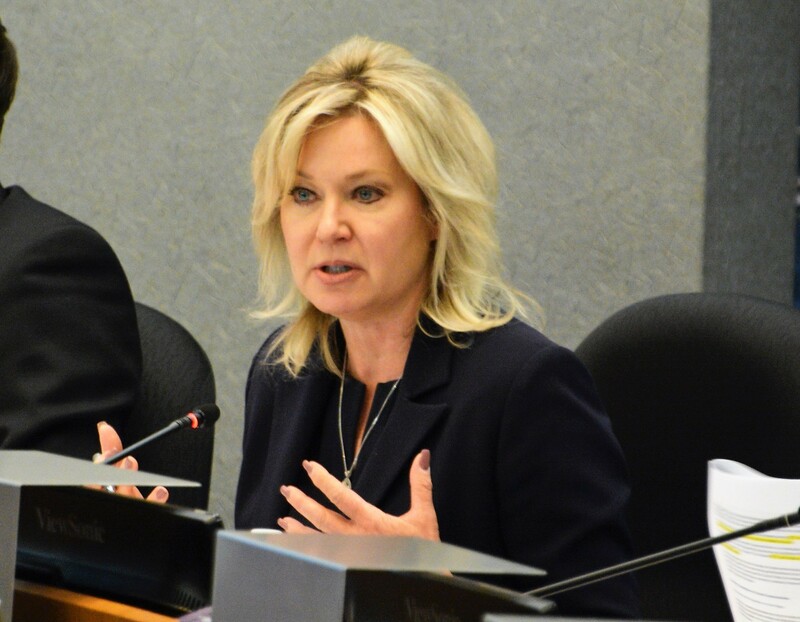 Mississauga Mayor Bonnie Crombie, a progressive voice on the board in the past, who pushed for the audit in 2016, said she was pleased with the report and said it provides a path forward to rectify systemic racism in the Peel police service. “I truly feel that systemic racism occurs everywhere. In my organization, in Peel police, in every corporation; to be aware of it and how it occurs is the best way to defend yourself and address it and overcome the systematic bias and racism that exists,” she said. Mississauga Mayor Bonnie Crombie at Friday's police board meeting. The 142-page document describes a police force that doesn’t represent the fast-changing, diverse community it serves, raises barriers for racialized members of the force, punishes those who speak out, and has turned a blind eye to systemic bias. According to 2017 data from the force, 20 percent of uniform staff were racialized (425, out of a total uniform complement of 2080), while PRP’s jurisdiction, Brampton and Mississauga, is 65 percent visible minority and aboriginal. Non-uniform staff are slightly more representative of the community. The review by CCDI included one-on-one interviews with PRP senior leadership, two public town halls, a census and inclusion survey of employees (garnering 1,808 responses out of 3,048 workers, including civilian staff), and focus groups. A disturbing 79 percent of Peel police employees who took part voluntarily in focus groups reported experiencing harassment or discrimination within PRP, while 90 percent of participants reported witnessing such behaviour. Despite the force's recent contention that it has begun to address systemic problems, the CCDI report states, "there are significant challenges related to the rigidly hierarchical paramilitary organizational culture of policing in general, as well as identified aspects of the Peel Regional Police in particular… . Some of the fundamental issues cannot be solved by more programs and initiatives, or changes to policies and directives. This suggests a need for more extensive culture change. We recommend that PRP create a task force or working group involving members of the Chief’s management group and others throughout different ranks and divisions within the organization to identify the culture PRP wants to create in the future, what aspects of the organizational culture need to change and/or can reasonably be changed, and use a rigorous change management approach to embark on an organizational culture change initiative." However, when rank-and-file employees were asked if “everyone benefits from equal access to resources and opportunities” within the PRP, only half of the more than 1,800 who filled out a survey offered a positive answer. According to Michael Bach, the founder and CEO of the CCDI, an industry benchmark for such a question is 70 percent. He told the board that there is an apparent “divide” between the understanding of police leadership and the lived experience of employees. According to the report, 93 percent of police leaders believe the force is committed to diversity and inclusion and that it exhibits fairness, consistency and flexibility. This disconnect between the opinions of employees and senior leadership is one of the issues highlighted by CCDI. The Ontario legislation that serves as the guideline for policing in the province, the Police Services Act, explicitly states that forces must reflect the community they serve. “I assure you, we have heard you, there is room for improvement, and Peel Regional Police will be better because of your input,” he added. 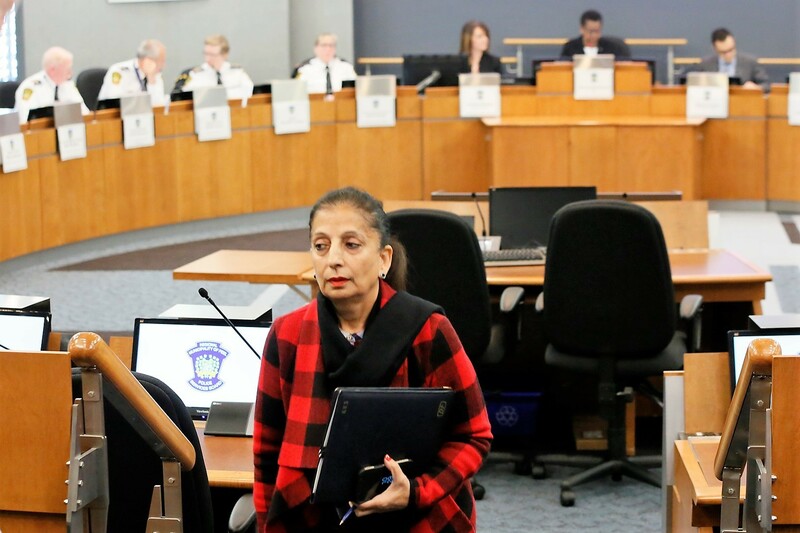 Ranjit Khatkur, the co-founder of P-CARD (Peel Coalition Against Racialized Discrimination) was instrumental in bringing the audit about, after she and other groups delegated the police board in 2016, demanding a sweeping review of equity practices. “Much of what is in this important report was known to members in the community and many in the criminal justice system,” she said after attending Friday’s meeting. Officers who testified in the hearings recalled a frat-house culture in which racist cartoons and emails were spread among officers, along with racist jokes and racially demeaning names such as “Gunga Din”. Leaders not only ignored but often took part in the racist behavior, including one manager who posted an overtly racist cartoon on the office wall. The tribunal ruled that Sandhu’s failure to get a chance at promotion was, in part, due to his ethnicity. “And as such I find that the applicant has been subject to discrimination because of race, ancestry, place of origin, and ethnic origin in violation of … the [Human Rights] Code,” wrote Bruce Best, a vice-chair of the tribunal. The force tried to prevent the application packages of candidates from being used in the hearings, but the tribunal ordered the force to produce them and the evidence showed that many of the more than 30 candidates allowed to compete for the inspector’s position had far poorer qualifications than Sandhu, though his supposed lack of experience had been used as justification for excluding him from the promotional process. The audit report released Friday indicates that 52 percent of officers in the force believe favouritism, not merit, determines who gets promoted and who doesn’t. Then-chief Jennifer Evans released a video statement immediately after the tribunal ruling, assuring the public that promotional practices had changed since 2013 and the circumstances of Sandhu’s case were “not reflective of the force’s values.” She offered no apology, and the force has yet to offer any public acknowledgement or apology to him or the South Asian community. Khatkur says the report should point the way to one clear outcome. Speaking after the meeting, McCord said the report highlighted many areas for improvement. The rapid pace of growth in Peel Region has been a challenge for the PRP, he says. “What you have to remember is we are very unique as a community. We have grown so rapidly and the diversity in this community has grown so rapidly, and we have challenges to try and keep up to that, and we are trying to catch up and keep up to it,” he says. But McCord didn’t acknowledge more alarming shortcomings highlighted in the report, where the findings point to a clear cultural disconnect. To assist in boosting diversity in the PRP, the organization is creating a new position. 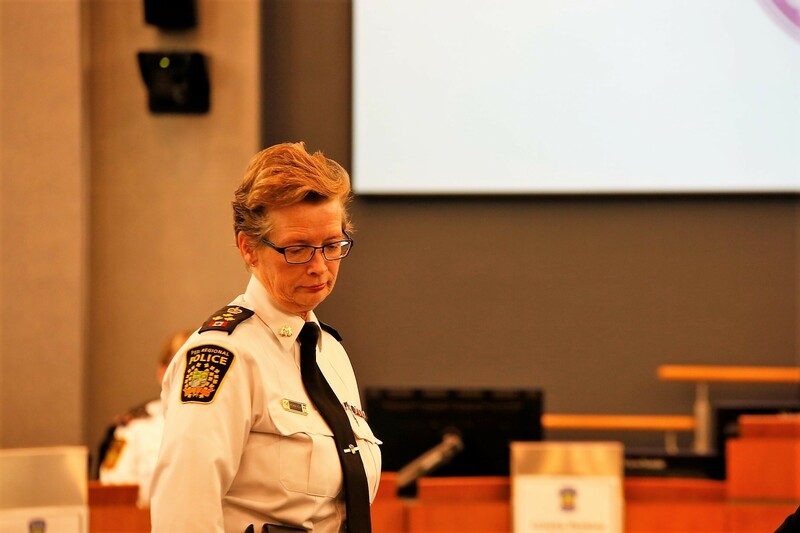 This person will report directly to the chief and ensure “cultural competency and a diversity and inclusion lens is applied to all aspects of Peel Regional Police, both internally and externally,” according to a release from the Police Services Board. Improving the PRP leadership’s “cultural competency” is a key aspect of eliminating the divide between what senior leaders believe about their organization and what employees are experiencing. “That’s only going to be done through education,” McCord said. Police board chair Nando Iannicca said he was pleased the report was accepted unanimously and also accepted by senior police officials. Iannicca described the report as “sobering,” and acknowledged it verified things community advocates have been saying for years. “We must hold ourselves to the highest possible standard. We can always do better,” he said. But he stopped short of an apology, noting that while the review has been underway, there has been turnover in both the chief and chair positions, and it’s time to move forward. That may be difficult to do in light of recent history. Jennifer Evans’ predecessor, Mike Metcalf, in 2007 refused to acknowledge the need for cultural sensitivity training ordered by the Human Rights Commission after a ruling against the force in a racial profiling case. Metcalf publicly stated he did not agree with the finding, despite damning evidence. Evans lashed out against the board when it called for the audit, following pressure from community groups, and its results were supposed to be presented last year, while Evans was still chief, but they were kept under wraps. After she suddenly announced her resignation in the fall, then departed in January, the board stated the audit results would be released. The most contentious issue dogging the PRP on race has been Evans’ steadfast support of the “street check” process, colloquially known as carding. In Peel, where 9 percent of the population was Black, the force’s data over a five-year period showed that on average almost 25 percent of those being stopped on the street and asked for ID without a legitimate crime-investigation reason were African-Canadians. Between 2009 and 2014, Peel police conducted 159,303 carding checks, with black people three times more likely than white people to be stopped. When the police services board advised the PRP to end carding in 2015, Evans refused to comply. The force ended the practice only in 2017, after the Ontario government curtailed it. But last year, before her resignation, Evans complained, without evidence, that not being able to card had led to a spike in violence in Peel. She was widely criticized by community groups and criminal justice experts for making the unsubstantiated assertion, before announcing her resignation last fall. "What's wrong with being in an area where you don't live?" asked host Matt Galloway, puzzled by a comment that seemed to confirm her lack of awareness of her own biases. Interviews and surveys with police leaders and board members carried out in 2017-18 demonstrated a gap in terms of understanding that “inclusive” leadership includes “an internal, self-reflective behaviour that is dynamic over time,” the CCDI report says. Anonymous comments by Peel police officers who participated in the audit's focus groups. 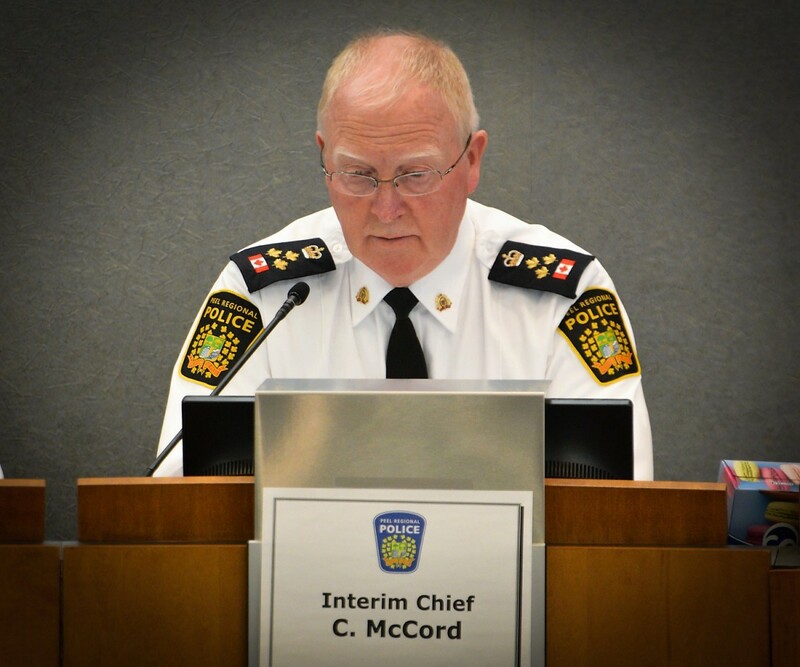 McCord noted the report highlights initiatives Peel Regional Police have already implemented to improve diversity and inclusion, including improved hiring practices by recruiters. The CCDI report agrees that programs and policies in place at the PRP meet progressive standards, but notes that without better self-awareness or willingness to implement them effectively, little will change. For years, advocates have been pointing out the issues and demanding police address the dynamics brought to light in the report, but without results. “What we didn’t have before is this report; this report gives us a roadmap to move forward,” McCord said. The CCDI makes a long list of recommendations. First and foremost, a commitment to building trust, something critics said the former chief refused to do; but also enhanced accountability mechanisms, improved community engagement, better representation of women and and racialized service members, and a commitment to culture change. The recommendations come at a time when the search is on for a replacement for former chief Evans, who left in January. The report’s harsh words for police leadership strongly suggest an outside hire may be the best option for changing a culture in desperate need of an overhaul. McCord declined to comment on the matter. Chair Iannicca, who has previously talked about the importance of choosing the right person for the role, also declined to comment on the eventual hire. 1. Acknowledge systemic issues and feedback from minority members of the police service and the community, and commit to building trust by addressing these issues and educating members of the police service. Establish a zero-tolerance policy for sexist, racist, anti-immigrant, and homophobic remarks or jokes. Establish cultural competence as a requirement for promotion. Improve the rigour of diversity, equity, and inclusion competency reviews in performance appraisals. Increase repercussions for inappropriate behaviour or speaking disparagingly about the populations served by the PRP. Enhance and increase diversity and inclusion related measures throughout the service. Carry out diversity census and inclusion surveys every 2 years. Boost opportunities to gather feedback and report back to employees on what was heard and will be done. Encourage more meetings and communications and input mechanisms between service members of different ranks. Conduct an audit of records of street checks and traffic stops to determine if certain groups are being stopped disproportionately. Continue the Chief’s email box so that members of the PRP can communicate directly with the chief. Improve public and internal surveys to understand responses according to demographics. Training for all employees in bias-awareness, bias mitigation, and cultural competence training, and require it at intervals for all service members. Make anti-racism training mandatory. Expand educational opportunities for all officers on various populations and issues such as racialized people; cultural and religious groups; LGBTQ2+ identified individuals; and Indigenous peoples. Increase diversity training for new recruits beyond the current half day, out of a 9-12 week training program. Conduct an audit of those who have not completed currently available training to ensure they get it. Provide mental health first-aid training for all service members at regular intervals. Address concerns of “reverse discrimination” by enhancing communication and education on the experiences of minority members of the service; educate PRP members on privilege, stereotypes and bias, particularly pertaining to gender and racialized persons. Increase resources for community policing and boost its prestige by making it a criterion for promotion. Consider expanding community advisory groups to new demographics. Educate leaders in understanding the impact their biases may have on selection, development, and advancement decisions. Offer development programs to women and racialized persons to encourage them to consider opportunities for development and different positions. Expand the initiative of hosting recruitment fairs with under-represented communities. Increase technology support and flexible work arrangements. Apply policies and practices related to disability equitably across the organization. Create a task force or working group involving members of the Chief’s management group and others throughout different ranks and divisions to identify the culture PRP wants to create, what aspects of the organizational culture need to change and/or can reasonably be changed, and use a rigorous change management approach to embark on an organizational culture change initiative. “Focus group participants indicated that when discrimination or harassment occurs, the tendency is to work through it one-on-one. “The option to report it is generally not considered for fear of reprisals.” Individuals indicated that those who report will be “marked” and harassed even further either by peers or supervisors, managers, etc. Respondents cited that racist, sexist, bullying, and homophobic language is used toward peers. Some respondents stated that when this takes place, they don’t feel that they can report, as in many cases the ‘culprit’ is someone in a more senior position. “Sad to hear them talk badly about Brampton every day ... . I note they see Mississauga in a different light, and I suspect that is because Brampton looks like it is filled with more newcomers. Same crime can happen in Mississauga, but it is viewed differently”.